DropBox is by far the best service of free online storage. With 2 GB (expandable to 8GB) is the service you can count on. One of Dropbox’s strengths is that applications can connect to your Dropbox account. 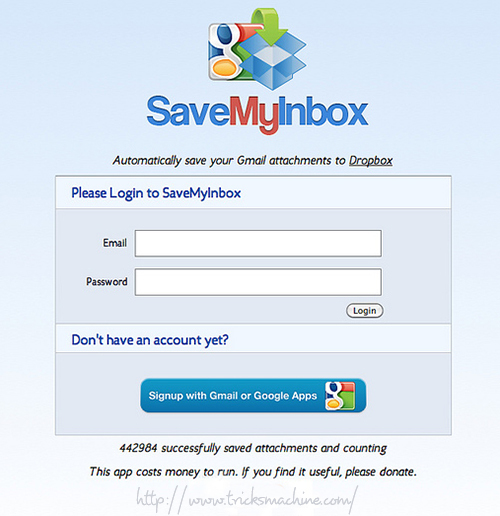 Today I will show you Save My Inbox , an application that automatically backs up your Gmail attachments to Dropbox. With three easy steps, users can synchronize automatically every few hours for the email, and download the attachment directly to the Dropbox. Save My Inbox is a simple webapp that will automatically save your Gmail attachments to your Dropbox, enabling you to check them offline without having to remember which ones to save. It was developed by Stefano Bernardi. How does SaveMyInbox work ? How to Fill out Web Forms Automatically with Autofill Forms!